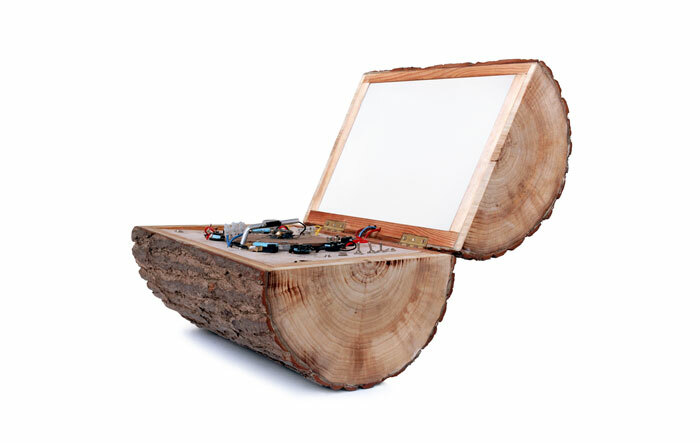 The log1k was originally designed and constructed as a complete alternative to using laptops during live audio performances. 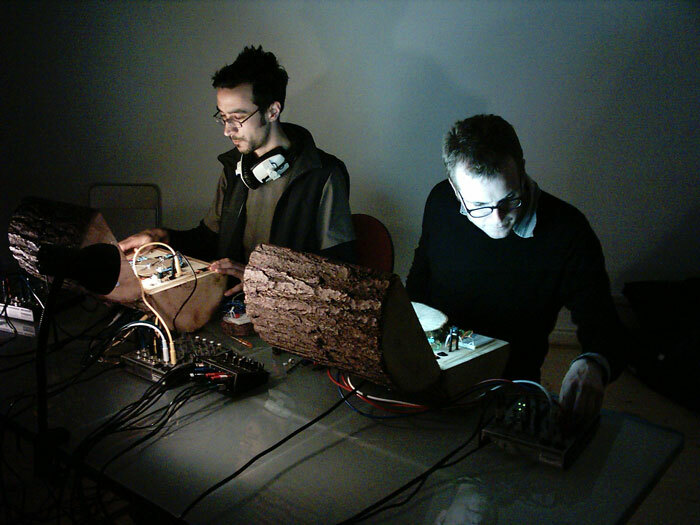 The Log1k is a sequencer & sampler, which also contains; Signal generators and other noise making devices. It has several, Mic inputs and 8 Audio outputs. It requires around 24 AA batteries. A mains 240v Fluorescent tube provides a screen like glowing panel which also provides electrical interference. The Log1K is defined by being constructed from a fully circle log section. This is divided into two half's and hinged at one side; thus giving it a laptop like appearance. The Log1K was removed from operation after damaging several sound systems and catching speakers on fire. At the heart of each log1k lies a micro controlled step motor. This allows many log1ks to run in sync with each other, as well as other software packages and Owl Projects own Soundlathe. log1k also comes fitted with a series of micro and reed switches which trigger samples and control audio circuits. Sometimes during a performance I can smell burning plastic, what is this and is there something to worry about? As long as it’s coming from the Log1k its probably ok, if it is coming from the speakers, simply turn down the volume, if there are flames unplug the Log1k immediately! Not only will this damage the speakers, it may effect the performance of the Log1k. Also the wooden components are sensitive to flames. If the smell comes from the insides of the Log1k this will be the 1.5 v batteries used for the beat switches, the effect produce by short circuiting the battery is a huge boom on the PA, however - the battery also heats up and eventually melts the casing, the result being molten plastic and fumes. Try and keep performances to less than 30 minutes and remove batteries from the device afterwards. My Log1k has scuffed woodwork on the outside, how can I remedy this? We recommend a pine coloured filler for large scuffs, followed by an application of fine sand paper, finish with teak oil and polish. I plugged my Log1k in and no sound came out, what is wrong? Yes this happens quite often, I'm afraid. There might be a bad solder in there, or a loose connection. Lift up the lid and check through. If you are in the middle of a performance you might have to improvise with an iLog for a while. The contact switches seem to have little effect when I use them how can I get more effect from these? Try wetting your fingers for greater electrical conductivity, this can increase the effects by up to 90 percent. Dry fingers will not work! My Log1k falls over when I lift up the lid, it doesn't seem to stand up at all! Don't worry, this is a fault of the early designs; you will find inside the case a strap to fix to the front of the table with a clamp, this will stop it rolling over. On the later models there is a bar which bolts through the back of the lid. Sometimes I prop it up with a screw driver. This has a habit of falling over mid performance if you start to move to the beat too much. When I boot up the Log1k the screen appears to remain blank - is there a problem? No this is normal. It should have a uniform glow throughout; be sure this is kept clean and free from dust to ensure optimum performance.